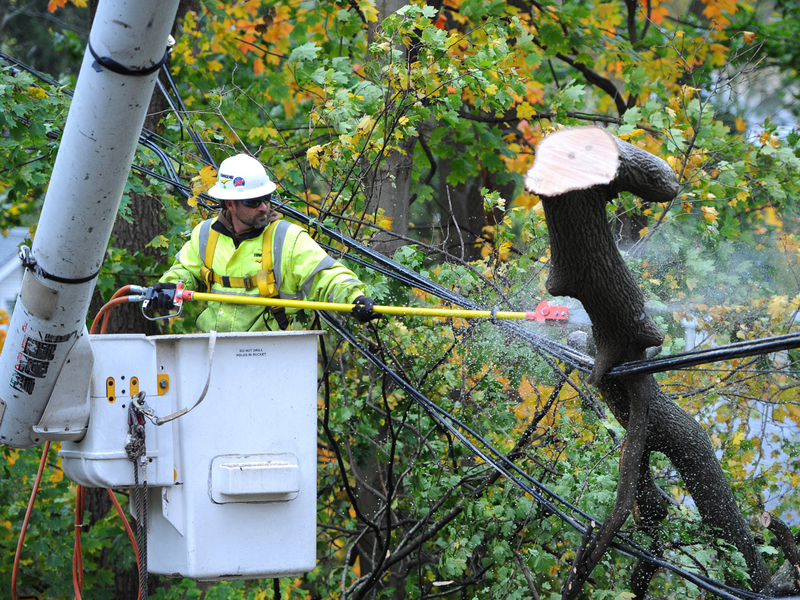 More than 7.9 million utility customers across the Mid-Atlantic States and New England were without power Tuesday, after Superstorm Sandy made landfall with hurricane-force winds and torrential flooding. Connecticut Light & Power (which offers outage reports in both map and table formats) says more than 458,000 customers were without power. Delmarva reports more than 42,000 customers lost power. BGE reports more than 160,000 customers are still without power. PEPCO had at least 11,000 customers without power. More than 50,000 outages were reported by Mon Power and Potomac Edison. LG&E and Duke Energy each report fewer than 100 customers offline. NStar reported more than 162,000 outages. Additional outages were reported by Western Massachusetts Electric Co. (more than 9,000 customers) and Unitil (almost 500 customers). National Grid says more than 210,000 customers had lost power. Central Maine Power reports almost 59,000 customers without power. Bangor Hydro reports more than 600 customers affected. DTE reports about 110,000 customers without power. CMS reports about 3,900 customers are affected. Public Service of New Hampshire says more than 108,000 customers were without power. Unitil reports more than 83,000 customers lost power. National Grid says about 11,600 customers are without power. Public Service Electric & Gas, which is tweeting outage information, says at least 1.4 million customers are offline. Jersey Central Power & Light, which publishes map of outages, is reporting more than 969,000 homes lost power. Atlantic City Electric has more than 184,000 customers without power. LILCO reports more than 942,000 customers on Long Island were without power. Con Edison reports more than 811,000 customers were without power in New York City and Westchester. In upstate New York NYSEG reports more than 114,000 customers are affected. RG&E reports another 19,000 without power. National Grid says nearly 16,000 customers are without service. Duke Energy reports more than 500 customers lost power. Progress Energy reports about 250 customers lost power. First Energy reports more than 238,000 customers reported blackouts. Additional outages have been reported by Duke Energy (about 20), DP&L (175), and South Central Power (75). Peco in southeastern Pennsylvania was reporting more than 585,000 customers affected. FirstEnergy was reporting more than 213,000 customers were without power. PPL Electric Utilities was reporting about 376,000 customers without power. UGI says more than 14,000 customers are without power. National Grid says more than 163,000 customers had lost power. Duke Energy reports almost 500 customers lost power. SCE&G reports 32 customers are without power. Green Mountain Power reports more than 7,200 customers affected. Dominion Virginia says more than 76,000 customers were without service.